When we first saw this collection of Cath Kitston’s stationery products, we thought we were actually looking at old pieces (and in this case, that’s a GOOD thing). The hardcover 6" X 8-1/2" address book features vintage-looking wallpaper/fabric designs on the cover and inside at each letter tab. There’s plenty of space for each address, including email and cell phone. 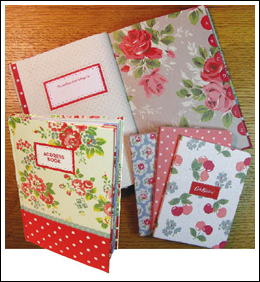 Each of the 3 blank mini journals (4" X 5-1/2", 96 pgs) shows a different cover with matching inside sheets. These are perfect for your retro kitchen or anywhere else.